Pho Tam is a Vietnamese restaurant located in the Whalley area of Surrey. I have heard rumours of Pho Tam having the best pho in Metro Vancouver. Being the avid pho lover that I am, I just had to try it, so I came here with my friend Melissa to see if it lived up to the hype. Our food started coming out about two minutes after we ordered. This is probably a good thing if you are hungry and in a hurry, but I got the vibe that we were being rushed out. The salad roll here was pretty good. It was filled with slices of pork and shrimp. The spring roll came out super crispy and burn-your-mouth hot. 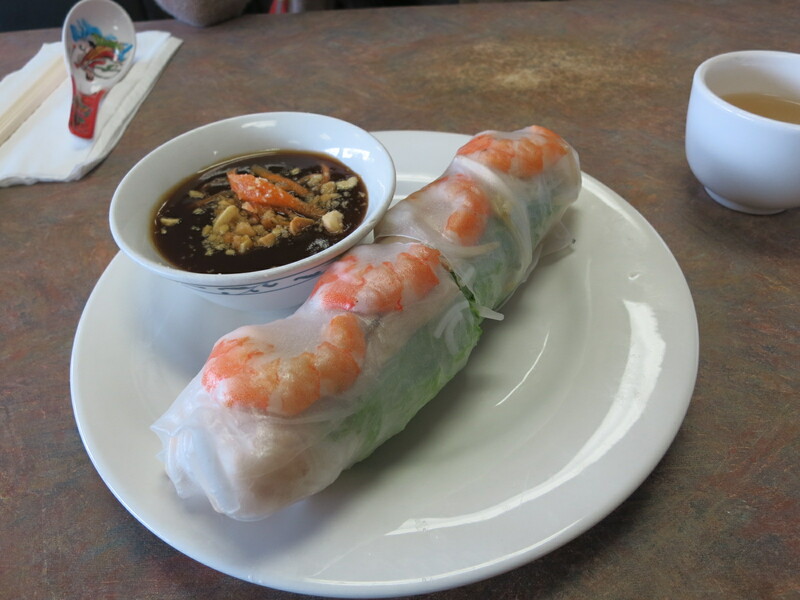 They make their spring rolls slightly different from other Vietnamese restaurants. There are no noodles inside the roll. Instead it is more of a meaty filling with almost a creamy texture inside. I enjoyed it and it was nice to have something different. We both had the medium-sized rare beef pho. I had seen many picture online of this dish and I have heard great things, so my expectations were pretty high. However, I was immediately disappointed at how cooked the meat was. I was expecting bright pink rare beef on top, but most of these slices had clearly been sitting in the broth for a while and they weren’t that tender. On a positive note, the broth was delicious and up there with the best I have had. It had a very pure beef flavour with mild hints of spices and no noticeable over use of MSG. Pho Tam was good, but honestly it didn’t live up to the hype for me. It was just a decent bowl of pho and nothing earth shattering. If I lived in Surrey I would come here, but it isn’t worth a special trip. Bao Chau on Hastings is still my favourite because the meat comes out rare every time you visit.